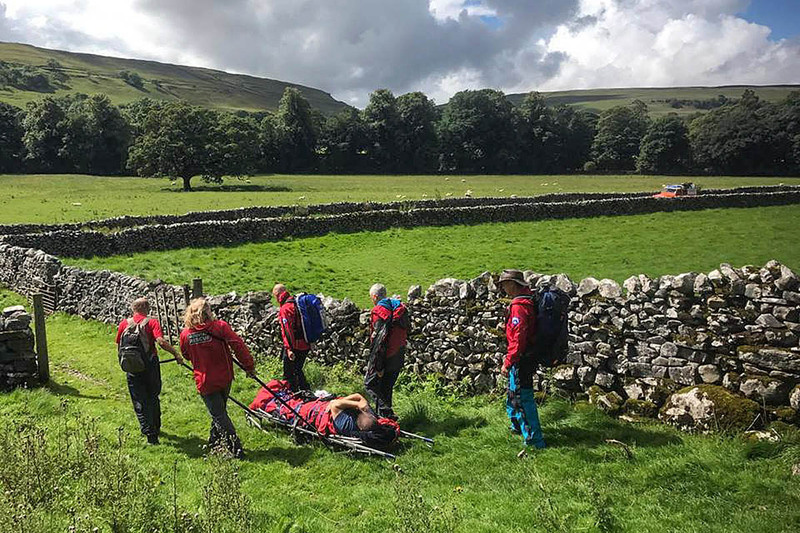 A Yorkshire Dales walker unwittingly became part of a rescue team’s history after he fell on the hills above Littondale. Graham Sugden was enjoying a short walking holiday with his wife in the area when he suffered a serious leg injury on the fells. His call for help was answered by Upper Wharfedale Fell Rescue Association. Volunteers from the Grassington-based team made their way to the site and treated the 62-year-old retired chartered surveyor from South Yorkshire at the scene. Mr Sugden’s rescue was fairly routine for the team, but marked a significant milestone in the 69-year-history of the association, as the walker was the 1,500th person to be rescued. The team had to administer painkillers to enable him to be placed on a stretcher before carrying him down the fell to a waiting road ambulance. The team said sadly the couple’s stay in Arncliffe had to be cut short with Mr Sugden ending up at Airedale Hospital near Keighley instead, but added nevertheless it had been a most memorable visit for them. Mr Sugden said: “What a relief it was to see the ‘cavalry’ coming over the hill to the rescue in the form of a dozen members from the fell rescue team. So professional and understanding of our predicament caring with my injury. Times have changed for the team since its formation in 1948 when in its first year of operation it had just seven callouts, involving missing walkers, stranded climbers, a dog, some sheep, two cows in a mineshaft and the sad task of retrieving two fatalities from a light aircraft crash. Callouts for today’s team are now approaching 60 a year. The rise reflects a national trend with a recent study showing that last year teams in England and Wales dealt with 1,812 incidents, an increase of 170 from the previous year. Of the total, 360 were serious or fatal. There were only 14 days in the year without a callout somewhere for the volunteer mountain rescue teams. The survey also suggested that possibly 500 of the callouts could have been avoided. Derek Hammond of the Upper Wharfedale team said: “Our own survey shows a much lower percentage and we attribute some of this to the awareness of visitors to the safety measures generated from the tremendous support the team is given by the local press and media. The rescue association has during its existence been graced by two royal visits, many years of patronage by the Lord Lieutenant of North Yorkshire and has celebrated its 1,000th callout with, last year, its 50th dog rescue.